The Flirts, a Norman Rockwell painting, appeared on the cover of The Saturday Evening Post published July 26, 1941. This is another favorite of Rockwell collectors, a classic enduring image of the world Rockwell painted. Alternate titles for this painting are Girl Driving Convertible and Two Flirts. This painting was Rockwell's 201st overall out of 322 total paintings that were published on the cover of the Saturday Evening Post. Rockwell's career with the Post spanned 47 years, from his first cover illustration, Boy With Baby Carriage in 1916 to his last, Portrait of John F. Kennedy, in 1963. This was also the third cover for The Post in 1941. 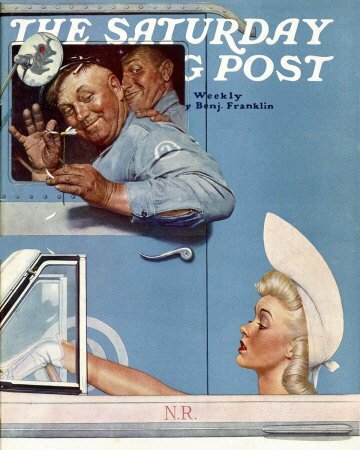 In 1941, there were six Norman Rockwell Saturday Evening Post covers published. The original oil on canvas painting, 34.25 x 27.25 inches or 87 x 69.25 cm is part of the collection of noted Norman Rockwell collector, Steven Spielberg. It was included in the 2010 exhibit at the Smithsonian Institute's Museum of American Art. The exhibit, Telling Stories: Norman Rockwell from the Collections of George Lucas and Steven Spielberg, showcased fifty-seven major Rockwell paintings and drawings and explored the connections between American culture as depicted in Rockwell's paintings and in the movies. One study is also shown on page 146 of The Norman Rockwell Catalogue. Sn unframed original oil on board study of the painting wa sold at auction at Sotheby's in New York City on December 3, 2007. The final price was $601,000. This far exceeded its pre-auction estimate of $50,000 to $70,000. In this painting, Norman Rockwell shows us a couple of regular guys, trying to catch the attention of a blonde in as convertible. One humorous part of the composition is that the blonde is almost painted in a caricature style to my eye. This is a beautiful girl being painted in such a way that she could represent almost any woman of the same beauty. The two drivers are obviously enjoying flirting with the lady. The driver is tearing daisy petals off a flower and saying "She loves me, She loves me not." Her demeanor seems to be saying "Not, Not, NOT." His counterpart in the passenger seat, with his hand on the driver's shoulder, seems to be offering encouragement to his buddy. The Flirts was only one of 322 Norman Rockwell Saturday Evening Post covers; Here is the list of Norman Rockwell Saturday Evening Post cover illustrations. I do not see a wedding ring on either hand of the driver. Maybe he is serious about this, instead of just playing around. If only she would just look his way, she might gaze into his eyes and fall for him. Maybe that is why her stare is fixed in front of her. Do You Have A Great Story, Opinion Or Contribution About The Flirts?